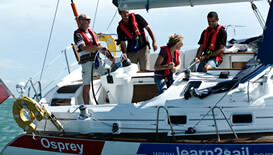 Course Type: Practical - 5 days onboard. (Please note that we can provide a complete transfer package to/from Faro Airport to our yachts in Portimao Marina which includes an extra nights stay onboard the yacht prior to your course starting- please ask for details). This is where you will really get to grips with handling a yacht under sail and power and to be in the position where you can make competent decisions about running the boat. You will be able to put into practice all that you have learnt on the Day Skipper Theory Course, and you will be actually navigating your own yacht. Those seeking a recognised yachting qualification. 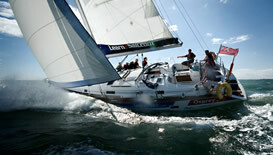 To be able to sail bareboat. Those that have or will be getting their own boat and are looking to gain confidence. Those out to become more confident and to be able to go further a field. Those looking to explore the area with the security of having an experienced skipper onboard. New sailors so that they can confidently take on the challenge of a flotilla holiday. Dinghy sailors moving up to yacht sailing. A confident decision-making in all aspects of yacht navigation and handling. Skilled in passage planning and its deployment. Conversant with the on board rules and sailing etiquette for every day situations. Qualified to apply for an International Certificate of Competency. You will be a qualified Day Skipper with all you need to convert your certificate into an International Certificate of Competency, I.C.C. (Full details are available on the RYA website). If you would prefer a more beneficial teaching ratio of 3 : 1, then ask about our Premium Training Scheme, giving you more time on the water to practise those new skills and drills - costing a supplement of just £60 per day.